There is no doubt that Exchange log files just eat disk space. Cheapskates conserve disk space by implementing Circular Logging on their Exchange 2010 transaction logs. However, those who want an effective disaster recovery plan find a way of budgeting for the extra disk space. Where Do You Find the Circular Logging Setting? In a nutshell circular logging is where the Exchange server recycles its transaction logs. Exchange relies on write-ahead logs to store events before they are committed to the database. Once 4 of these transaction logs have been filled up, Circular Logging assumes that by now the first log must have been processed and reuses that log for fresh transactions. The fatal flaw with Circular Logging is that it severely restricts disaster recovery. If you allow Circular Logging then Exchange 2010 can only restore as far as the last backup, this is because many of the transactions have been overwritten once they have been stored in the database. Fortunately, circular logging is disabled by default. In contrast, when all the transaction logs are available, Exchange Server 2010 automatically rolls forward the logs and replays the operations up until the Exchange Store stopped working. The minor downside of turning off circular logging is that the extra logs consume disk space. In fact, if you select circular logging then this prevents Exchange 2010 from even making differential or incremental backups. So with circular logging in place, you are restricted to normal (full) backup. Where Do You Find the Enable Circular Logging Setting? Launch the Exchange Management Console (EMC). From Database Management, select the appropriate database (DB1). Seek the Maintenance tab, Enable circular logging is the last checkbox. The default is no tick, Guy says leave it that way! 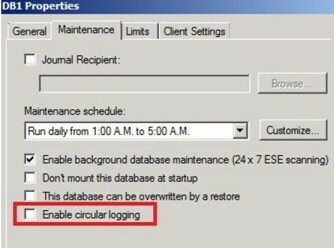 See Exchange 2003 Circular Logging settings. Why Does Exchange Allow Us to Turn Off Circular Logging? The main justification for enabling circular logging is when you are very short of disk space. Even in this situation Exchange 2010 has two files Res1.log and Res.log. However, these logs are only for the emergency when the disk is truly full. 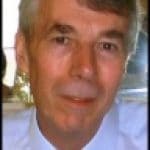 Exchange writes all uncommitted transactions to these files, then shuts down the server. One possible use for enabling circular logging is for public folders or newsgroups where you are less concerned with recovery since the last backup. Before you decide to enable circular logging consider the alternatives, also double-check that you understand what could go wrong. If it’s lack of disk space that’s worrying you then monitor the Windows System Log for event 2013. This warning is triggered when free space reaches 10%. Armed with this knowledge you can either configure an Alert via Performance Monitor yourself, or else get a third party tool to trigger an email alert when free disk space reaches this threshold. One of the workst Exchange server horror stories occured when a new super-duper Anti-Virus program decided that the E00.log and priv1.edb contained virus and decided to try and clean them, thus corrupting the Exchange mailstore. Unfortunately, circular logging had been enabled thus there was no way of restoring the email. When an email arrives, Exchange 2010 writes a transaction to the log. If the server’s disk is busy there will be a delay before the information is committed to the store database file. 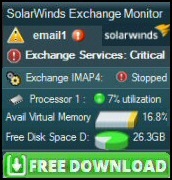 Exchange also uses a checkpoint file. This file (E0.chk) records which transactions have been written to the store database (Priv1.edb). So, if you allow circular logging to over-write some of those transaction logs, then you cannot recover any data after the last backup. However, if you disable circular logging, then you Exchange 2010 replays the transactions and restores the Exchange store to how it was before the disaster. This re-reading the logs is called a hard recovery and happens automatically. If you ever want to restore Exchange Server 2010 successfully, then avoid circular logging. There is only one occasion to select circular logging, and that’s in an emergency when you have underestimated your free disk space, even in this scenario it may be better to dismount the store until you can add extra storage rather than enable circular logging.